Here's a fanart I made when SSFIV was out. Well... what to say. I made this from scratch so ask me if you want to make some modifications on it. Modifications? It had me from hello. In fact, the more I look at it, the more I appreciate it for what it is. If you haven't already done so, then vectorize. Anything after that will be orthopedic IMO. This is your own artwork? It's fantastic! The details are great, I love how all the other characters from Street Fighter are standing around watching the girls beat each other up. Your lines are clean and the proportions are perfect. And such rich colors! Great job! I'm glad to see that you like it. I don't do much wallpapers with my own works, this is the first one. Sasusin > This is no scan. I made the whole thing from scratch on photoshop. ROCKOQATSI > I'm not good with vectorised things. You can do it if you want but since I made this as a PS3 wallpaper it's not very usefull I think. Hum... I think the next one will be a close-up of Juri. Quote by DenXDHum... 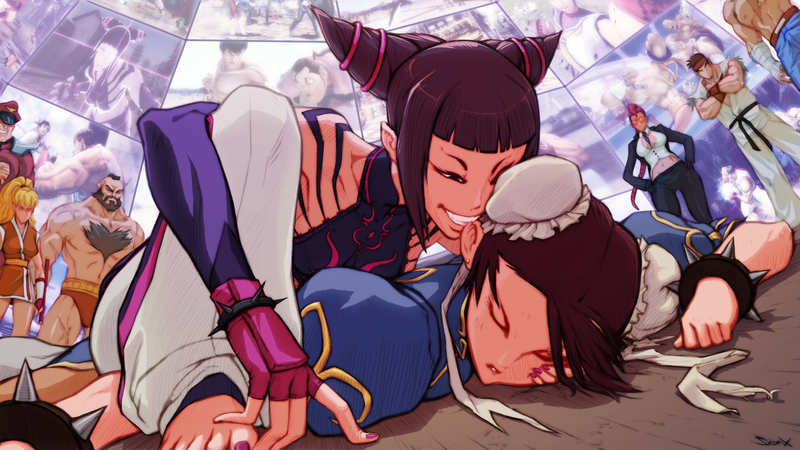 I think the next one will be a close-up of Juri. Wow you sir are one awesome drawer! I'm working on a second one with Juri. Truly remarkable piece of work!